William Monroe’s girls basketball team watched the fouls pile up quickly in the first half against Madison County Thursday night. But in a sign of a maturing team, they didn’t really panic. They switched to a slightly uncomfortable zone, survived until the half and held on to a narrow lead heading into the locker room.Then in the third quarter, they exploded. The Dragons ripped off a 15-4 run coming out of the locker room, transforming the pace of the game while rolling to a 65-37 victory over the Mountaineers to sweep the season series in the border rivalry. The Dragons’ foul trouble didn’t impact Sam Brunelle’s offense in the first half as Brunelle poured in 21 of Monroe’s 25 in the first two quarters. She finished with 29 points, 12 rebounds and five assists. But she really controlled the game in the second half by helping get Martha Apple going with a couple of quick dump offs down low. Apple finished with 17 points, all of them in the second half. 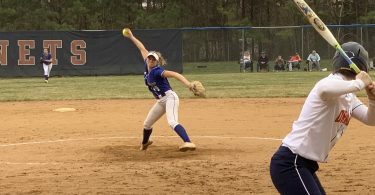 She had what Stafford referred to as a coming out party at the She Got Game tournament in Washington that the Dragons participated in last week. Apple scored 29 and then 17 points in Monroe’s two-game stretch in the high level tournament. 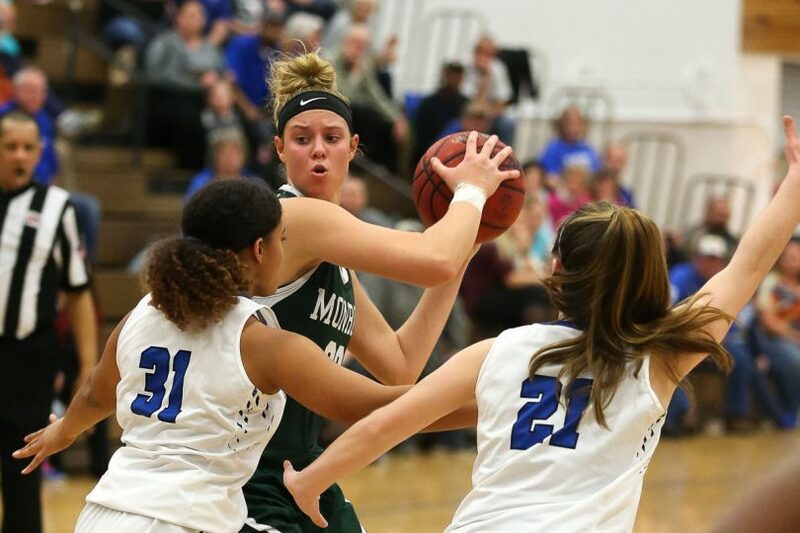 It was clear Thursday night Apple, who also had eight boards and two steals, has settled in, and is capable of catching and finishing consistently when Brunelle finds her as defenses collapse. Bryonna Woofter chipped in five assists and two steals on the night and helped push the pace at the point all night. Hailey Morris knocked down a 3-pointer during that explosive third quarter run and also hit Apple with a slick pass in the lane late. Iyanna Carey had a couple of buckets in transition. Madison proved in the first half once again that they will physically compete with the Dragons defensively, throwing everything they could at Monroe much as they did in the first half of the first meeting. The Mountaineers’ offense, however, found its own tough sledding against the Dragons as turnovers piled up and Monroe got going on the boards before pushing in transition. Sabrina Lewis managed nine points to lead the Mountaineers while Allie Burbridge had six and Makenna Santinga had seven including a 3-pointer. 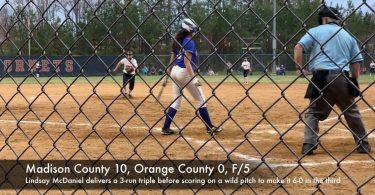 The Dragons will take a week long break before diving into Holiday Tournament play next week while Madison turns around Friday night and will face Orange County.